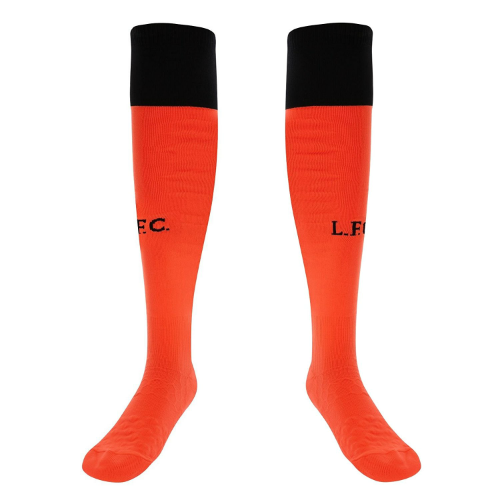 While the orange shirt has met with mixed reviews after being released for the 2017-18 season, the Liverpool third kit socks have been a surprising hit with the fans. No doubt, it’s the novelty of wearing something different, something bright, as well as the revent popularity of bold colors. Inexpensive and durable, the socks – like the rest of the Reds’ kit – are made by New Balance, a US based clothing manufacturing giant. They have been designed with comfort in mind, feature a cushioned footbed and are made from breathable material. Their design inspiration comes from the original wooden signage of the famous Kop stand and is dubbed “Bold Citrus”. They are trimmed with a dark collar and brims and are made of 97% Polyamide and 3% Elastane. As a Reds fan it’s hard to get fully excited about this year’s orange kit, but the Liverpool third kit socks may just be the exception. They have been surprisingly popular since their release and while it may be hard to match them to some classier items in your wardrobe, they certainly stand out in a fun way. Red shirt is the way to go for any serious Anfield fan, but few people will judge you by your socks. They are bound to start many interesting conversations that will help you point towards your chest for the Reds pride. They are a lively edition to the Liverpool apparel this season. Let us know below what you think about this quirky piece of kit! New Liverpool Football Kit – Orange!? Keep Calm Love Man Utd – the Shirt Lives On!